3. Display - 6.18" FHD+ in-cell IPS display, brightness, contrast, color temperature, sRGB coverage, etc. If you put together the Cubot P20 and the Cubot X18 Plus and compare their specifications on paper you'll see both smartphones are almost identical. The only difference is the slightly bigger display of the P20. This has only urged us to put the P20 to our usual routine of tests and in-depth examination and see if there are any other differences. Moreover, we're interested in how the performance would change, check the display's measurements and see if battery life would change and in what direction. Let's start with an overview of the official specifications. 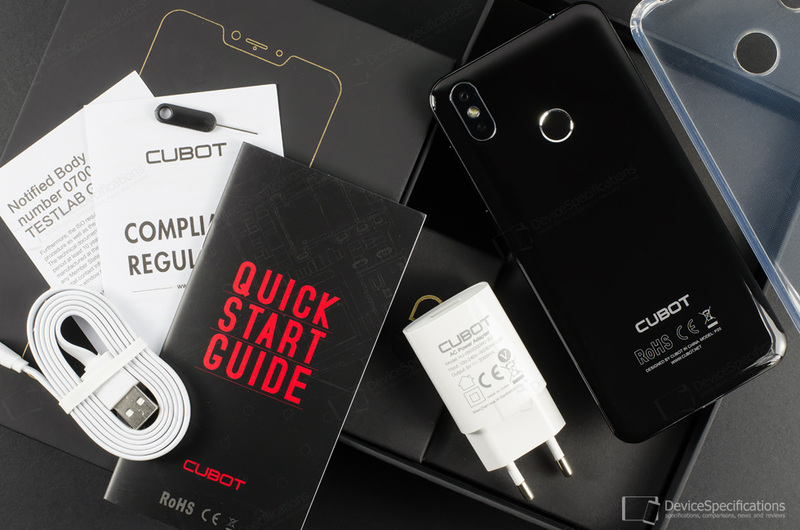 You can buy a Cubot P20 at a promotional price from Cubot's official AliExpress store. Cubot P20 is adorned by a 6.18-inch display with an in-cell IPS panel that has an FHD+ resolution (1080 x 2246 pixels). The display panel offers a typical brightness of 450 cd/m2 and a static contrast ratio is 1300:1. It covers 90% of the NTSC colour space reference. A 2.5D curved glass protects the front of the handset. It is connected to the polycarbonate back by an aluminium alloy frame. The device is powered by a 4000 mAh hi-density Li-Pol battery that cannot be removed. It is coupled with a 5V/2A fast charger and provides up to 30 hours of talk time and up to 243 hours of standby time according to Cubot's lab tests. Cubot P20 features two rear cameras. The main one is equipped with a 16MP Samsung S5K3P3SX sensor interpolated to 20 megapixels. It is paired with a 5-element lens with an f/2.0 aperture and a 1A LED flash. The auxiliary VGA snapper is interpolated to 2MP. The selfie camera on the front packs an 8MP GalaxyCore GC8024 sensor interpolated to 13 megapixels. It is combined with a 4-element lens with an f/2.8 aperture. The smartphone is based on the good old MediaTek MT6750T system-on-chip. This chipset houses an octa-core Cortex-A53 CPU with four 1.5GHz cores and four 1GHz ones plus a dual-core 650MHz Mali-T860 MP2 GPU. There are 4GB of single-channel LPDDR3 RAM on board, clocked at 833MHz and 64GB of internal memory, expandable with up to 128GB. The model supports 2G GSM (850, 900, 1800, 1900 MHz), 3G W-CDMA (900 MHz, 2100 MHz), and 4G FDD-LTE (800, 900, 1800, 2100, 2600 MHz) network bands with LTE speeds being Cat. 6 ones. The wireless connectivity options of the P20 include Bluetooth 4.0, dual-band Wi-Fi 802.11 a/b/g/n, Wi-Fi Direct, Wi-Fi Hotspot. The smartphone works with GPS and GLONASS and is equipped with a Micro-USB 2.0 port and a 3.5 mm jack. The model runs on stock Android 8.0 Oreo. 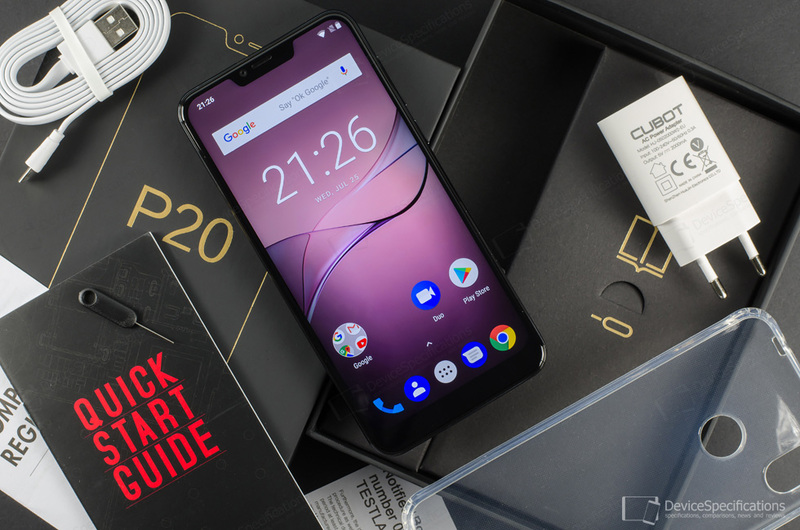 Cubot P20 arrives in a stylish black box that has a velvety feel to it. The top of the lid has the model's name and outline imprinted on the top. On the back, there's information about the main specifications and certifications of the device. Inside, the handset in the top level compartment with the Cubot logo to its side. Under it, in three separate boxes, you will see the various accessories. On every box, a sign depicts its contents. All pictograms are in gold colour. The whole box conveys the idea of luxury.